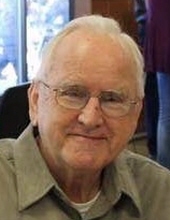 Roy James Jablonski 84, Retired C.P.D., of Buffalo Grove. At Peace with Christ, Monday, November 26, 2018. Beloved husband of the late Ann. Loving father of Laura (Ted) Warzacha and Joe (Kathy) Jablonski. Beloved son of the late Anthony and Anne nee Zmich. Dear step-father of Angie (Bob) Valentini, Joe (Julie) DiLorenzo, Mary Ann (the late Dan) Miller and Rose Ann Petersen. Fond grandfather and great grandfather to many. Dear brother of the late Eleanore, Micky and Ernie. Fond uncle and great uncle to many. Visitation Thursday 3:00 to 8:00 P.M. at Cumberland Chapels (FRIEL FUNERAL DIRECTORS) 8300 W. Lawrence Ave., Norridge. Funeral Service will be held Friday 11:00 A.M. at the Funeral Home. Entombment With Military Honors ,Queen of Heaven Cemetery, Crucifixion Garden Mausoleum. To send flowers or a remembrance gift to the family of Roy James Jablonski, please visit our Tribute Store. "Email Address" would like to share the life celebration of Roy James Jablonski. Click on the "link" to go to share a favorite memory or leave a condolence message for the family.